The parades are coming! The parades are coming! Take out your red, white and blue as you get ready for America's ancient tradition of Fourth of July Parades. All through the 512 area, children will march through the streets of small-town Texas. Wherever you are, there will most likely be a parade within a ten-mile radius, so we have compiled a list of Austin's biggest and best parades for you! Join the City of West Lake Hills for a classic celebration of 4th of July. 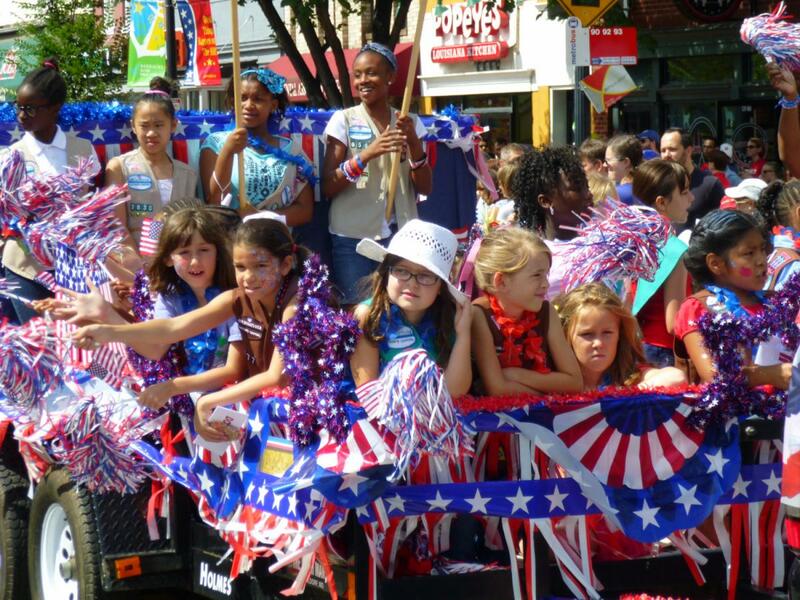 Locals will parade through the street, creating a definitive American spectacle, perfect for celebrating the fourth. Stay after to scarf down some breakfast burritos, ice cream, cookies, and coffee, along with your holiday favorites such as watermelon and popcorn. There will be live music and costume contests so come wearing everything red, white and blue! Beep, beep! Watch out or you might get run over by the bikes storming the streets. This parade focuses entirely on the littlest riders as the streets are filled with decorative bicycles, wagons, and floats. This unique take on the classic American parade is simply adorable and the perfect occasion for your littlest family members. The parade is followed by even more family fun with bounce houses, music and finally a firework display to round out the evening. March on over to Lakeway for their “Salute to Volunteers” parade to take part in America’s small-town tradition. The parade will meander through the city to reside at the Lakeway Activity Center where the Grand Marshal will address the lively crowd with stomachs full of donuts, orange juice, and coffee. Afterward, locals will head to the Lakeway Swim Center for discounted fun into the night. Bring your bathing suit and prepare to conquer the twists and turns of their exciting water slide. The festivities start at 10, so put on your patriotic gear in preparation for Cedar Park’s parade. The route begins at the H-E-B Center at Cedar Park and finishes at the Cedar Park Recreation Center, just in time to start the Celebration portion of the day! The Celebration features all your favorite Fourth of July entertainments such as live music, bingo, a washer tournament, bounce houses, free watermelon and of course, a firework display. All in all, this event boasts any activity you could hope for on an Independence Day. Get ready for a jam-packed day of a mix of both traditional and quirky July 4th events. The day kicks off of course with a traditional parade, followed by the Frontier Days Festival where the town of Sertoma’s personality really comes out. The first event features a Sam Bass Shootout followed by a cowboy sing-a-long and then Swifty Swine Pig Races. If that’s not enough, there will be a Pepper Eating Contest at 3 and a firework show once the sun sets. Finally, you can take a deep breath and watch “StarWars: The Last Jedi” with your family, after all, is said and done. Lace up your tennis shoes and brace yourself for Lago Vista’s 5k race. The adult race treks through the town followed by a Kid's Fun Run for the little ones. If your legs can still support you, head to the parade for some fun for the whole family. Then, Bar K Park will be hosting all sorts of festivities such as slip and slide baseball and train rides for kids. Once the sun dips behind the horizon, fireworks are scheduled to explode into the sky above the beautiful lake, creating an incomparably picturesque scene. Come one, come all! Wells Branch is hosting their annual FourthFest celebration that is kicked off with a parade, followed by crafts, carnival games, and pool games. For the older ones, the Billy Holt Band will be playing under the Big Tent, but for the little ones, Ian Varella the ventriloquist and Magician Gus Davis will also be performing. Stick around until the sun sets to see the fireworks launched into the sky. Put on your red, white and blue and head out to San Marcos for a day full of classic fourth fun. The night kicks off at 6 with food and activity booths accompanied by the sweet sounds of The Revs. Wyzer then will take over the stage just before the Children’s Patriotic Parade and Costume Contest commences. Then, they, of course, will illuminate the sky with a beautiful firework display. No matter where you find yourself on the big day, you will not be disappointed. Austin offers any stereotypical July 4th activities, so you cannot go wrong at any of these events. For even more Fourth of July events, check out this complete list of Things to Do in Austin for July 4th, on 512area, your free guide to everything local in the Austin area.